Ever hear a passenger describe an airport terminal as enjoyable or useful? We hadn’t either… until recently. Finally, airports are catching on to flyers’ needs and incorporating some unique spaces and activities within their terminals to keep us entertained, connected and productive. There are a handful of airports leading the way and hopefully more will jump on the bandwagon soon. Delayed flight? Long layover? Work or family has you stressed? 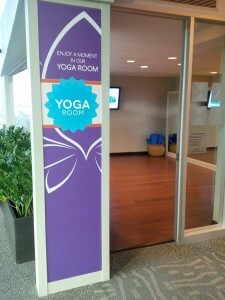 Check out the Yoga Room in terminal 3 at O’Hare. 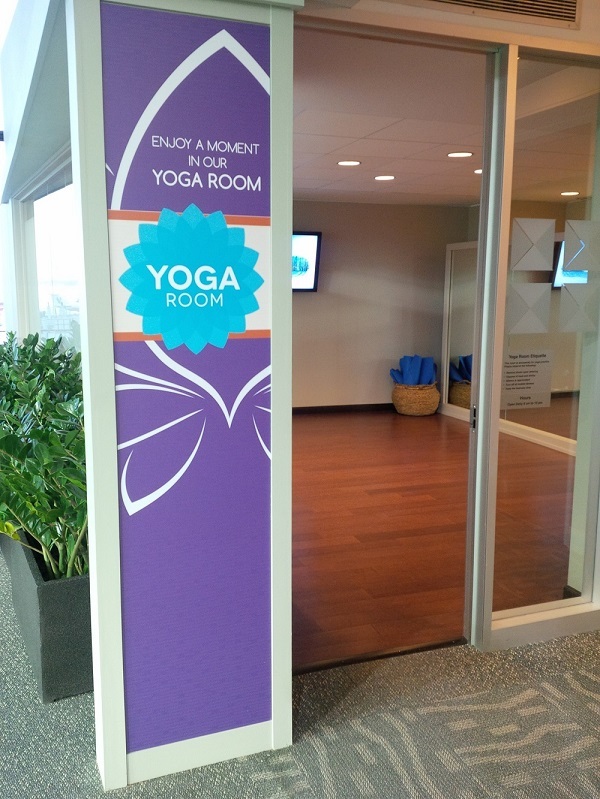 Stocked with yoga mats, yoga videos and flight information boards, you can do a little downward dog and keep track of your flight at the same time. Need a nap? Maybe a shower too? Dallas/Fort Worth International Airport has introduced Minutes Suites in terminal D with another location in the works. Each suite is like a miniature hotel room for passengers with a daybed sofa, fresh pillows and blankets, a noise-cancelling system and audio program promising the equivalent of three hours of sleep in just 26 minutes. Each suite includes an HD TV with web access and current flight information. Taking care of business? Gatwick Airport offers the world’s first Business Workboxes where passengers can set up a private, mini office for GBP5 per hour, or GBP10 per day. Munich Airport has opened its own complementary Recreation Area, between gates H32 and H33 in terminal 2, with 34 reclining seats and 20 workstations. London City Airport, a favorite with corporate travelers, boasts the first Bloomberg Hub. 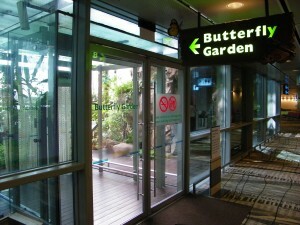 Singapore Changi Airport has the world’s first Butterfly Garden, a movie theater and rooftop swimming pool. There is so much here to keep you occupied that you might not want to make your next flight. Like Business Workboxes, Heathrow has its own version known as Thinkpods (private, individual workstations) in terminal 5. While you can pass the time doing business in Thinkpods and Business Workboxes, relaxing in yoga rooms or taking a nap, catching a movie or a quick swim, you still have to keep an eye on flight times and gate changes. Airports haven’t left this important aspect out of the equation. Most people fly with at least one, if not more, electronic devices (smartphones, laptops and tablets). Airports and airlines are sending necessary information with passengers using mobile-based solutions to keep passengers informed and on time. No more checking flight boards or standing in line waiting for the next available agent. That alone tremendously drops airport stress level. And with more charging stations being added throughout gate areas and terminals, even dealing with dead batteries is becoming a thing of the past. Not only will our corporate and leisure travel planners book your trip and accommodations, we also give you the scoop on how to spend your time while waiting for flights. We’ve even been known to pull a few airport contact strings to make sure our clients have access to the resources and services they need to make the journey as enjoyable as possible.